Discord Dark IPA | Pyramid Breweries, Inc. Discord Dark IPA celebrates the marriage of two distinct flavors, the Dark Ale and the IPA. The traditional bitterness of an IPA is juxtaposed against a black malt canvas, creating an ale that keeps your taste buds working to discover all of the unique flavors imparted by the 5 different hops and malts. Taste follows nose... hoppy with nice roasted malt... a little harsh in the pepper at the end. Overall another good black ipa. not my favortite because of that strong pepper at the end but still worth a shot if you see it around. It pours out pretty black with some reddish/amber hues. The smell is dominated by earthy and piney hops. The flavor is a bit odd. At first there is this hoppy flavor filled with earthy notes and it stops. Then there is a chocolate hint with roasted malts. The problem with this beer is, it didn't seem to blend together. It was like drinking two separate beers at once. Not bad, but I won't pick up again. A very clear but dark ale, but I can't say anything about the foam, having slipped this one into the tumbler. Smell is hoppy, some alcohol phenol, and malt and sweet. A bit piney. A bit chemistry lab. Not much citrus. Taste is very good, malt sweetness coming in late, then dried fruit (maybe prune), caramel, and coffee run by fast. Mouthfeel is fast and dry and refreshing...no cloying sweetness or syrupy feeling here, and carbonation is moderately scrubbing. Bitter notes follow later and hold in a nice sustain of the hops. This was my first dark IPA, so with little to base this, I still liked it rather much and am inclined again to try the style. 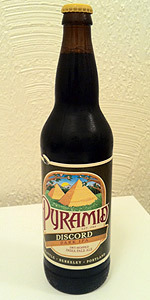 Discord Dark IPA from Pyramid Breweries, Inc.